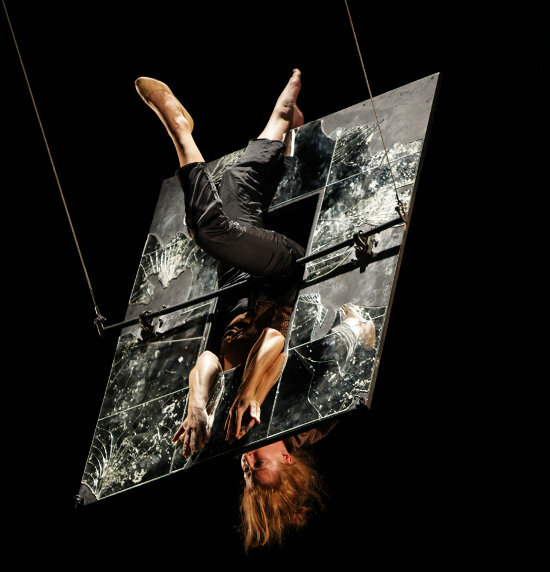 I trained as a trapeze artist at the Centre national des arts du cirque in Châlons, and aerial technique and the vertical dimension have remained central in my research. It is a skill, an art, a form of expression that allows me to change a situation or a common theme into a metaphorical idea that lifts it out of the ordinary. For Miroir, Miroir, the design of the 'set' and the design of the 'apparatus' are inseparable; the two were intertwined from the start. There's a scene in Ingmar Bergman's film Cries and Whispers in which a man puts his wife in front of a mirror and describes his own characteristics through each of her features. There's a tension in the scene that fascinates me—it's the question of what we choose to show of ourselves through our exterior appearance. What do we protect or hide, and what, beyond this, makes up our selves? In Miroir, Miroir I wanted to capture a sense of a person horrified at their own reflection, and to give as well this feeling that the distance between the reflected and the real has almost disappeared. So it seemed interesting to construct a mirror—suspended, floating—on which I could move but where I would be 'stuck' in my own image, as well as being there with flashes of the reflected audience, who would be involved in the piece and returned to their own reflection. After we made the mirror, it took me some time to tame it, to figure out how to use it and move it, and to see how to reach the freely expressive states that make up the show. I build my shows on issues that are of paramount concern to me—issues that I think can be shared by everyone but I interpret the woman in Miroir, Miroir as a character, a metaphorical 'figure'. The audience aren't the subject of the piece, but I'm urging them to come 'through the mirror' with me. The most beautiful thing is when members of the audience tell me that they too plunged into the mirror, crossed its threshold, and that the piece invoked personal emotions and experiences, connections that they may have felt at the time without being fully aware of them. It's not very interesting for the audience to just watch a female character having her own identity crisis, but it takes on another dimension when it comes to wider questions: Who am I? How does my environment affect me? In what sense am I an 'identity'? How do people perceive me? What object refers to itself more than the mirror? The Looking Glass is a very strong symbol. It is the world of the imagination: the inverted world, the unknown, the unreal. Rather than referencing a specific story or fairytale, in Miroir, Miroir the mirror is a symbol of the 'irrational', and a metaphor for the other side—the more secret part of our selves. I don't like having to put the piece within a genre. It's difficult because the word 'circus' often evokes a world of great feats, entertainment—a lively and colourful world. The rhythm of Mirror, Mirror is played on a stretched, slender thread of inner feelings, yet the physical dimension, the risk-taking, the dizziness... they are all at the heart of the piece, and they are the characteristics that belong to the circus, the world I come from. Mélissa Von Vépy was interviewed by John Ellingsworth September 2011. Her piece Miroir, Miroir was created in 2009 in the frame of Sujets à Vif, SACD, at the Festival d’Avignon.